What's better than a cup of hot chocolate on a cold winter day? Hot chocolate transformed into donuts; that's what! Best part - besides the scrumptious flavor, of course - is that they are mini, which automatically ups the cute factor. If you're looking for a perfect snow day treat or Valentine's Day surprise, these tiny donuts are your solution! Preheat the oven to 350 F. Grease the donut pans (You can also use a donut maker. Just follow the directions on your doughnut maker for bake times). In a large mixing bowl, or the bowl of a stand mixer, mix together the flour, hot chocolate mix, cocoa powder, sugar, and baking powder. In a measuring cup, whisk together the milk and vinegar to create a sort of homemade buttermilk. Then whisk in the egg, vanilla extract, and melted butter (make sure it is room temperature, so that it doesn't scramble the egg). Add the wet mixture to the dry mixture and stir to completely moisten the dry mixture. Gently fold in the miniature chocolate chips. Place the donut batter into a large pastry bag or ziplock bag. Cut a large hole in the end of the bag and pipe the batter into the donut molds. Fill until almost full, leaving some room for them to rise. Allow them to cool in the pan for about 5 minutes and then place them on a cooling rack. While they are baking or cooling prepare the two frostings. Whisk together the glaze ingredients and roll each doughnut in the glaze when they are completely cooled. Place them on a cooling rack to allow the excess glaze to drip off and allow them to dry for 10 to15 minutes. For the marshmallow creme, beat together the melted butter, vanilla, and marshmallow fluff in a bowl using a hand mixer until completely combined. Add in the sugar and milk and mix until smooth. Dip the top of each donut into the marshmallow mixture. Allow to dry slightly, about 5 minutes. For the chocolate frosting, put the chocolate and cream in a medium-sized microwave safe bowl. Microwave in 30 second increments, stirring in between until completely melted. Then whisk in the corn syrup. 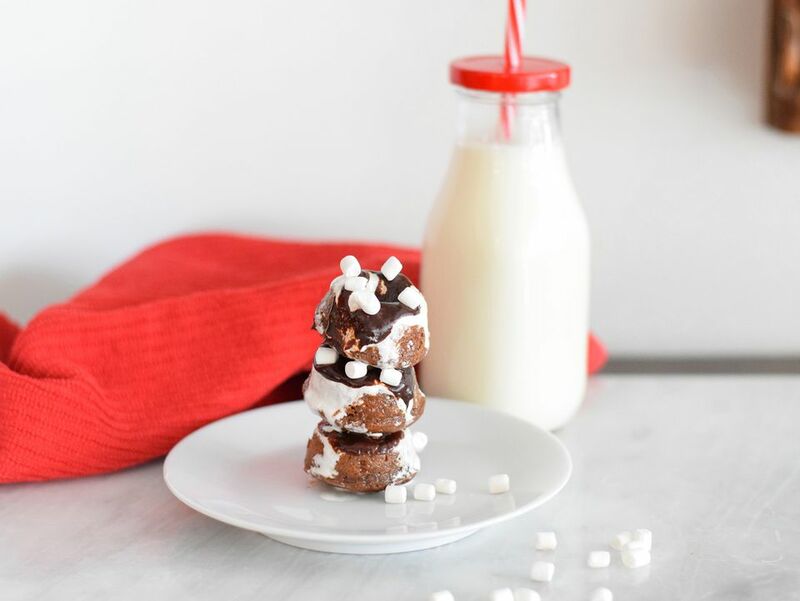 Dip each donut in the chocolate and top immediately with the marshmallow bits.